What is the Etsy IPO price? Etsy Inc. (Nasdaq: ETSY) set a price range of $14 to $16 a share for its IPO. The company will announce a final IPO price the evening of April 15. How much money will the Etsy IPO raise? Etsy will offer 16.7 million shares. At the midpoint of the price range, the Etsy IPO will raise $250 million. Following the IPO, Etsy will command a valuation of roughly $1.8 billion. 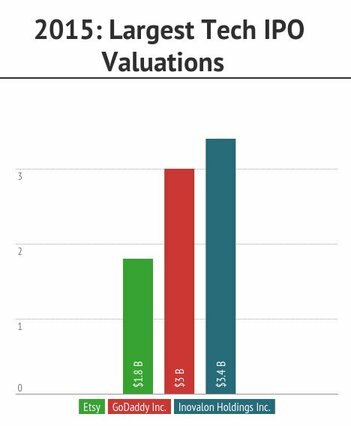 That makes it the third most valuable tech IPO so far this year, behind Inovalon Holdings Inc. (Nasdaq: INOV) at $3.4 billion and GoDaddy Inc. (NYSE: GDDY) at $3 billion. What kind of company is Etsy? Founded in Brooklyn in 2005, Etsy began as a way for its founders to sell their handmade wooden crafts online. The company now allows users to buy and sell everything from art and photography to food and bath products. Etsy is considered a "tech" company because of its role in e-commerce, but its culture exudes an entirely different image. Etsy has a B Corporation certification – an award companies receive when they meet certain social, environmental, transparency, and accountability standards. The company fulfills its certification by offering employee privileges like bikes for commuting to work and food waste composting. Etsy IPO: What is Influencing the Etsy Share Price? The Etsy IPO will be priced after market close on Wednesday, April 15th. It is likely going to be around $14 to $16. The Etsy (Nasdaq: ETSY) share price, if it follows a typical first-trading-day pattern, will jump from there – but will have trouble maintaining any first-day pops. The IPO is one of the most talked-about tech deals this year. Etsy plans to raise $250 million by offering 16.7 million shares. Once public, the New York-based e-commerce company will fight much larger firms for a share of the "marketplace market." Companies like Amazon.com Inc. (Nasdaq: AMZN) and Alibaba Group Holding Ltd. (NYSE: BABA) enjoy high gross merchandise volumes (GMVs) – the sales value of products sold over a time period. These sites also have significantly more users. 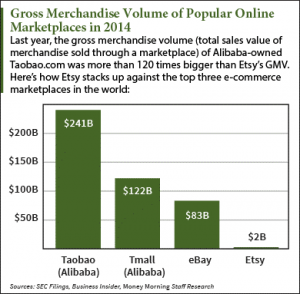 Statista reports that Etsy has 54 million registered users as of December 2014. That pales in comparison to Alibaba's 300 million users and eBay Inc.'s (Nasdaq: EBAY) 155.2 million users. Etsy IPO Valuation: Is it Justified? The Etsy IPO has been met with equal amounts of hype and skepticism. One reason for skepticism is the Etsy IPO valuation is $1.8 billion. And if the deal raises $250 million on April 16, Etsy Inc. (Nasdaq: ETSY) will be the largest tech IPO from a New York-based company in 16 years. "We have a history of operating losses and may not achieve or maintain profitability in the future," Etsy said in its IPO filing.